Dandy Blend™ Instant Herbal Beverage with Dandelion has to be one of the best bone-friendly discoveries I’ve made in a long time! 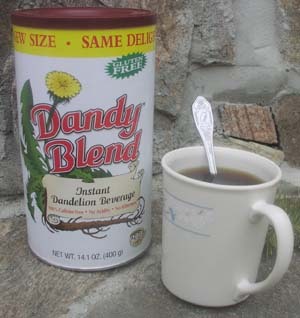 What it’s for: When I want to enjoy the rich, deep flavor of coffee, but don’t want the acid or bitterness, Dandy Blend comes to the rescue! What’s good about it: Made from extracts of roasted barley, rye, chicory root, dandelion root, and beet root, Dandy Blend™ tastes delicious and is gluten-free, acid-free, and 100% caffeine-free! What’s bad about it: I still need to use creamer. It’s better than: Decaf coffee because Dandy Blend™ contains no acidity! It’s not as good as: Hazelnut coffee…my favorite…but hey, Dandy Blend’s alkalinity helps me build bone density! Why I use this product: I love coffee, but if I’m going to have a hot beverage, I’d rather drink one that alkalizes my blood pH. Best place to get it: My local health food store, but you can also buy it online. For more information about the product, visit http://www.dandyblend.com. 5 Comments on Product Review: Dandy Blend! Thanks, Lois, for your input and encouragement. I’m glad you’ve found recipes here that you can use. Thanks for sharing, Trudy. My current creamer–which I like very much–is Natural Bliss (Caramel or Vanilla flavors), but I’ll give Original Silk Milk a try sometime. Kathy..have you tried it with Orginal Silk Milk..Silk Milk to me is like drinking a glass of liquid Macedonia nuts. I tried chocolate syrup in a glass once and that was NASTYYYYYYYYYY . I drink the flavored Gavelia coffees and I used LOTS of sugar and creamer in my coffee. But I never drink cold coffee unless I out and about and buy one of those in the bottle. I just love this in my silk milk. Just sharing. Sorry about the delay. It’s vacation time! I was just checking on coffee substitutes and saw the other brands. I thought you might have tried others besides Dandy Blend. I guess I need to do my own research. Thanks for all the information you put on your website. I like using your menus for ideas. It gives me a place to start when deciding what’s for dinner, etc. I have almost a whole year’s worth lined up. I’m wondering why you chose it over Pero or Cafix. I’ve never heard of Pero or Cafix, Lois. Please tell me more!